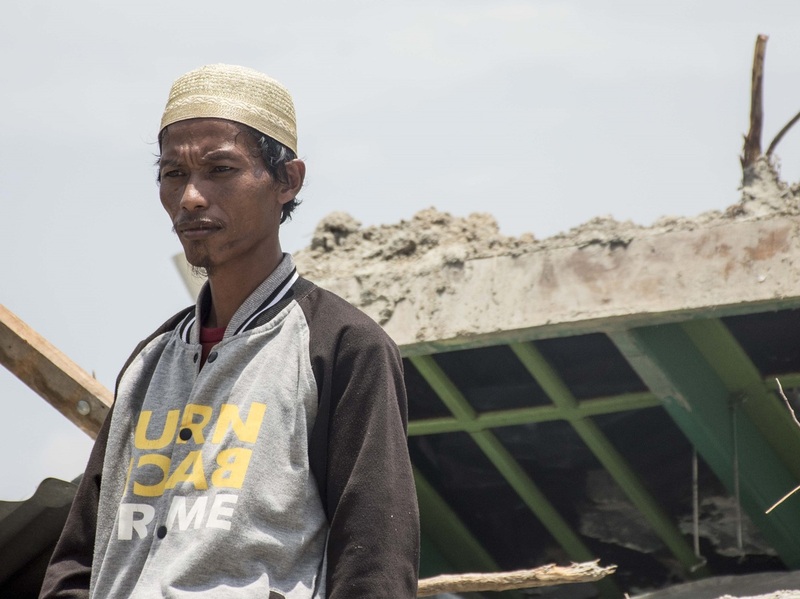 Survivors Recall Deadly Earthquake And Tsunami In Indonesia Disaster management officials put the death toll at 1,763, and their excavation has been slow, especially in areas where the quake buried whole blocks of houses. International aid has begun arriving. 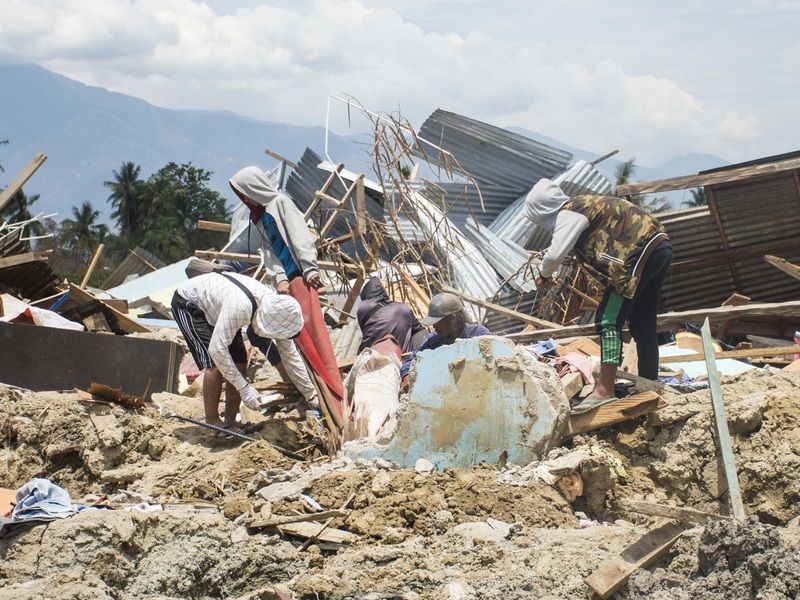 Residents of Petobo sift through debris to salvage what they can in the aftermath of the earthquake and tsunami disaster that struck the Indonesian island of Sulawesi on Sept. 28. Petobo lies in Palu city, and the neighborhood is thought to contain so many dead bodies that the government is considering halting recovery efforts and declaring it a mass grave. "The pungent scent of dead bodies"
Large chunks of the neighborhood Petobo have been laid waste. A walk through the reclaimed marshland on the southern edge of the city is literally a sinking feeling. The ground has a wobbly consistency — not quite jello — that is anything but solid. In the air, is the pungent scent of dead bodies. Resident Afit Badrudin, 28, describes standing at the cigarette stall when suddenly the earth began shaking horizontally, then vertically, and then gyrating as if "in a blender." He says he was carried along as the earth moved beneath his feet, and as an area of land began to collapse, he would jump to the next more solid strip. Afit Badrudin, 28, carries blankets and canisters as he shuttles between a makeshift camp and his destroyed home. He recalls standing at the cigarette stall fifty yards from his house when suddenly the earth began shaking horizontally, then vertically, and then gyrating as if "in a blender." Survivor Muhlis Ipul's story of survival is no less harrowing. He recounts his experience perched on a plastic chair stuck in the soft, porous earth, looking forlornly out at the ruins. Ipul describes the earthquake churning the ground so violently it created a sea of mud that swept houses away. It's a phenomenon known as liquefaction — soil mixing with water to create a quicksand effect. 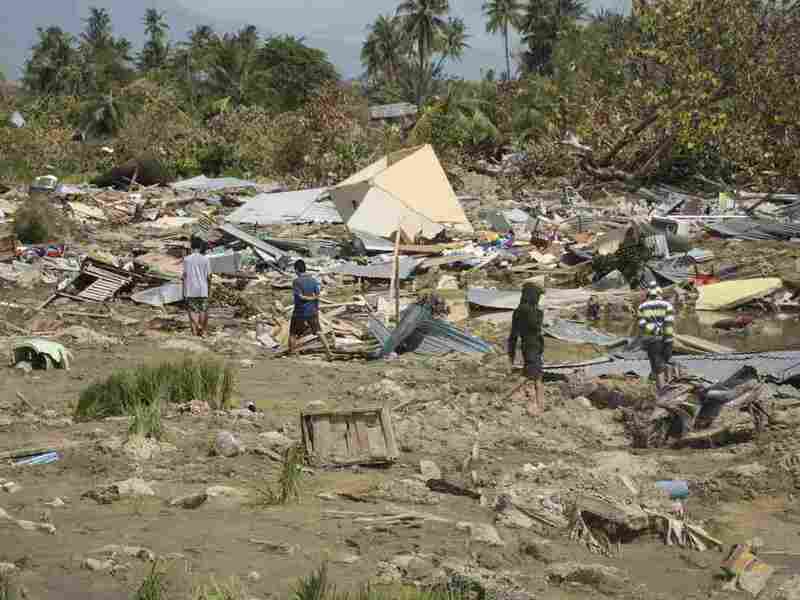 In the obliterated area of Petobo in Palu city, houses and trees were flattened and entire sections of the neighborhood born along on a sea of mud in a phenomenon known as liquefaction. Ipul says, "You can no longer see the houses," and concludes that "there are thousands of victims" buried beneath where we are standing. Residents estimate that some 7, 000 people lived in this affected area of Petobo, and believe many could be entombed there. 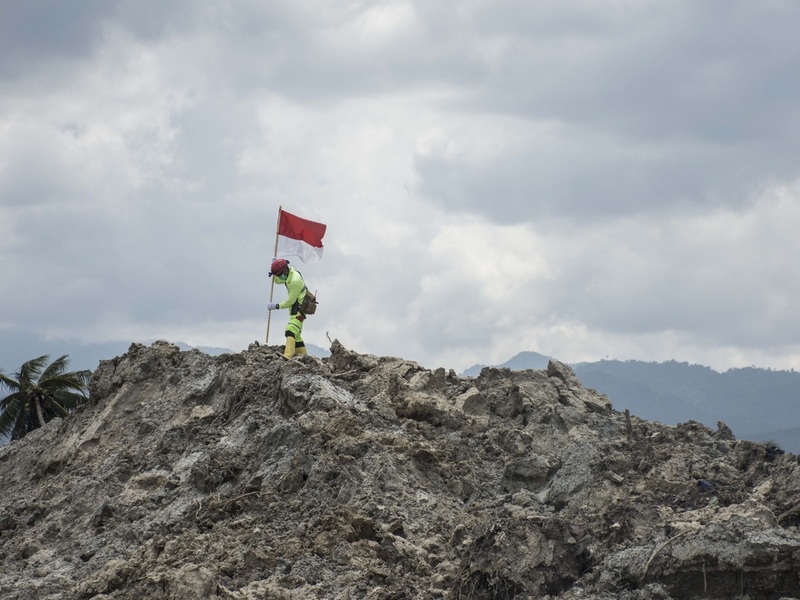 A rescue worker hoists an Indonesian flag atop a mound of mud in the Petobo neighborhood of Palu. Flags usually mark the spot of dead body, later to be retrieved. Ipul's wife and two young daughters, ages 7 and 5, had just showered and were changing their clothes when shaking engulfed their small house. They all ran out the front door together. "The asphalt broke up under my feet. I fell, got trapped in the cracks, and lost hold of my 5-year old girl. The last time I saw my wife and children, they were covered in earth," Ipul says. He points to a coconut grove several hundred yards from his house, and says that's where he thinks they were carried. During the temblor, Ipul heard people screaming for help. As he lay in the darkness, his eyes and face burning, mud suddenly exploded beneath him, dislodging him from where the asphalt had him pinned down. "God gave me a miracle," he says. "The rushing mud opened a way out. I saw a cable, tucked it under my arm, and the mud flow pulled me along." Ipul was deposited on a small rise where he sat and listened for the cries of his wife and daughters. They never came. Ipul guides us to the remains of his house where a small window framed in green paint peaks out from mounds of mud and debris. Ipul, a construction worker, stacks metal sheeting ripped loose from his home, and says he's collecting it to rebuild somewhere else. It is a life-affirming idea. But at 32, Ipul looks 52. Such is the strain of the disaster on this slight man whose feet are encrusted with mud. Flip-flops are all the shoes he has to negotiate the treacherous terrain. He says he'd like to pray at the mosque, but "You must be clean to enter," and he has no clean clothes. Muhlis Ipul, 32, stands before the remains of his modest home in Petobo, where the earthquake swept away his wife and two daughters. Ipul says his most painful memory is his youngest daughter, Windy, slipping from his grasp as they ran from their house, and he tumbled head over heels as the asphalt buckled beneath him. Christians dressed in their Sunday best flocked to sermons in Palu, a city with some 25 churches, seeking answers for what happened here. 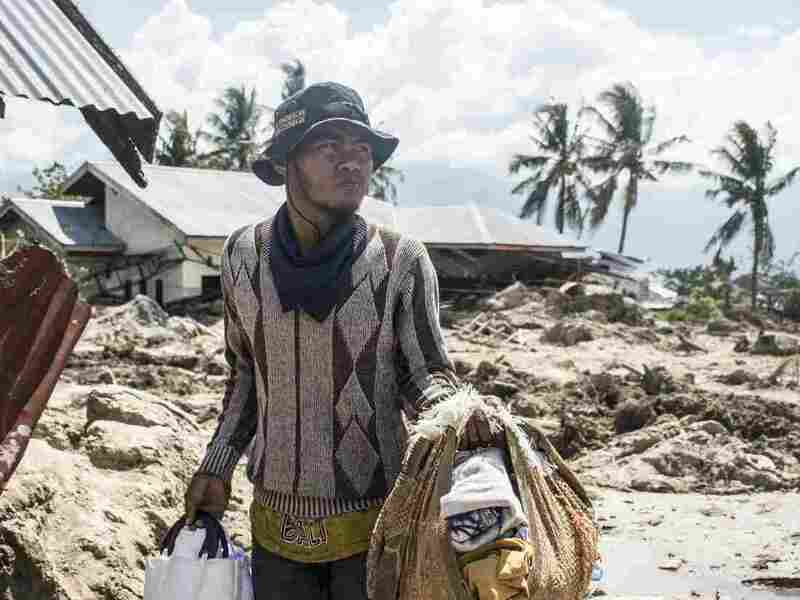 In the world's most populous Muslim country, Christians make up some 10 percent in Palu where neighborhoods and miles of coastline were obliterated 10 days ago. Badrudin says a widely known legend has it that an old tree with magical powers made the waters vanish from this one-time swamp. He says people also know that if they dug just 1 meter down, they will likely strike water, so porous is the soil. Speaking through an interpreter, Ipul says he knew nothing about the land's vulnerability, and that his most painful memory is his youngest child, daughter Windy, age 5, slipping from his grasp. He says with resignation, "There is no use in getting angry." It was an act of God. "I feel really sad, remembering my wife and children. All of us here — the people of Petobo — not just me. We have not been able to find our loved ones. And we all feel great loss." Ipul waits day after day for someone to retrieve the bodies of his family. He might wait in vain. The corpses that have been found to date have been dug up by hand. But heavy digging equipment is needed to approach the magnitude of the task that Petobo presents. And the precarious terrain makes it risky to excavate. The government says it is considering instead turning this one-time swampland into a mass grave, a proposal that can be expected to aggravate the grief of many families.